LifeQuest contains over 13 million patent documents coming from a long list of patent authorities. The large majority (over nine million) are full text. We provide machine translations for non-English documents, however the PDFs are in the original language. The database consists of documents that were carefully chosen to belong to the domain of biology. To determine biology relatedness, we examined patent documents from life science companies in a wide variety of domains from pharma to med tech to agrochemical to food and cosmetics, we extracted all the CPC/IPCR codes from our GQ-Pat sequence database, and finally we carefully examined the CPC classification documentation. We chose the broadest interpretation of biology while attempting to avoid most non-pharmaceutical chemistry. From the CPC codes, we then selected the equivalent IPCR and ECLA codes. We attempted to find the equivalent US codes, but the CPC to US codes pages provided by the USPTO are flawed and can be erroneous. To obtain documents based on their CPC, IPCR and ECLA codes, we selected all documents with those codes, but also all documents in the same tight family. This helps us be thorough since assignment of classification codes to documents is done differently by different authorities. The complete table of classes contained in LifeQuest is available upon request to customers and potential customers. Please send an email to gqsales@genomequest.com to request the full list of CPC codes in LifeQuest. At present, LifeQuest only provides a searchable index in English. Many foreign language documents are included in LifeQuest – these are machine translated into the English language before they are made searchable. We will expose native language queries for many common languages in future releases. You can query on the original publication language via the Publication Language (la) field. The codes to use are shown below. The list of fields available to constrain your search is provided below. Available as Column in Workfile? Patent documents are accessed via a patent number (PN) and kind code (KC). Kind codes define major legal events in a document. Very often a kind code A followed by a number defines a pending document whereas kind code B and a number apply to a granted patent. This is not always the case, but commonly, kind codes are a letter and a number, rarely just a letter and even less commonly 2 letters. We introduce the concept of kind letter (KL). A kind letter is defined as just the part of the kind code that contains letters. Now, we define a PN-KL combination as the latest numeric version within a KL. So, for instance, if a patent had an A1, A2, A3, and a B1 document, we define two PN-KL combinations, the A3 document which represents the A kind letter, and the B1 document which represents the B kind letter. In such cases, we attempt to augment the KL document with any missing information from earlier documents. So, if the A3 document was missing its claims section, we would augment it with the A2 information. See the augmentation process, below. LifeQuest will store every PN-KC combination available to it and make these all viewable in the Full Patent Viewer. However, it will only make the PN-KL documents searchable in the search engine. That is, when LifeQuest documents are searched, hits are organized by kind letter where a A document represents the latest A1, A2 ,A4 ,… document. This simple trick allows us to present documents from authorities that try to keep the same PN for applications and grants (EPO for instance) in the same way as authorities that do not (USPTO for instance). Available in Full Patent ViewerWhat is Searched in Search PageExplanationXXXXThe only document available. A1, A2, A3, B1 A3, B1 The A3 corresponds to the latest A document, and the B1 to the latest B document. A1, A2, A7, B1, B3, C2 A7, B3, C2 The A7 corresponds to the latest A document, the B3 to the latest B document, and the C2 is the only C document. But what is a patent document? When our providers send us documents, we get the latest version of a document. For instance, there could be several updates to a US1234A4 document. Moreover some documents are partial, for instance with no description. This happens sometimes when a document goes from US1234A1 to US1234A4 for instance, the description might not be included, because it is the same in the A4 and A1. We have an augmentation process to make documents complete. Let us say we have an US1234A7 document with missing claims and description. We will look in the document with a previous kind code first, i.e. US1234A4. 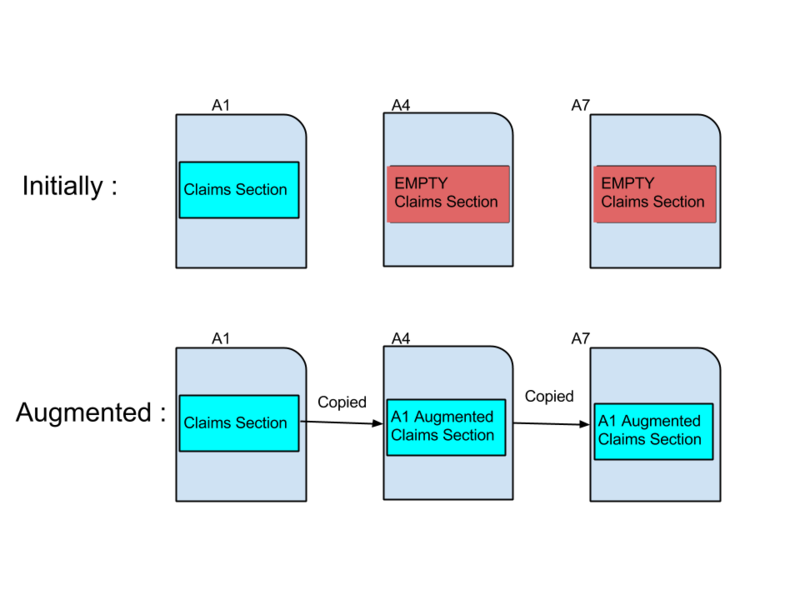 If the claims are in the A4 we will copy the A4 claims to the A7 document. But since US1234A4 does not have a description either, we will look in US1234A1. We will copy the A1 description to the A4 and A9 documents. This augmentation process is done within Kind Letters, in other words, an A4 document will not be augmented by a section in a B1 document and vice versa. All authorities are viewed the same way, that they change the PN when granted or do not change it makes no difference since the kind letter changes (from A to B mostly). The USPTO and the EPO are handled identically. Some Chinese documents that have the same PN and different KL are in fact totally unrelated documents. This happened when both indexing schemas used by SIPO for grants and applications crossed. They now appear and are handled differently since they have different kind letters. You will access applications and grants of the same document which might look redundant. Switch the search from document mode to family mode to alleviate this. Some small authorities using 2 letter codes will not follow the same schema and all kind codes will be shown (this is mostly for Thailand). The LifeQuest system stores patents with patent-number kind-code level granularity, and makes patents searchable at the patent-number kind-letter (KL) granularity. For more on this, see 6.3, above. The granularity at this level means that for a given family, every document in the family should be available inside of the database for viewing, and the most recent document within a kind-letter should be searchable. LifeQuest currently supports two different family definitions, the Simple Family and the Extended Family. The Simple Family is akin to the SIMPLE FAMILY as described in the WIPO Handbook on Industrial Property Information and Documentation. That is, a Simple Patent Family relating to the same invention, each member of which has for the basis of its “priority right” exactly the same originating application or applications. “Extended patent family” means a patent family relating to one or more inventions, each member of which has for the basis of its “priority right” at least one originating application in common with at least one other member of the family. For example, note how the US 4670093 A document draws these two simple families together.